Whether you’re a veteran cat lover, a brand-new owner of a sweet little kitten, or the frustrated companion of a feline whose behavior is driving you crazy, nationally recognized feline behaviorist Pam Johnson-Bennett helps you understand what makes your cat tick - as well as meow, scratch, and purr. Yes, you can learn to understand your cat. No, cats are not always aloof. No, they do not ruin furniture out of spite and intentionally do things to annoy you. Most often, these and many other feline fallacies are the result of a communication breakdown…between you and your cat. In this comprehensive book, Johnson-Bennett helps you understand the instincts that often determine feline behaviors, both positive and negative. Using behavior modification and play therapy techniques, Johnson-Bennett teaches proven methods that allow you to address the destructive behaviors in ways acceptable to both you and your cat - and help you build a great relationship in the process. 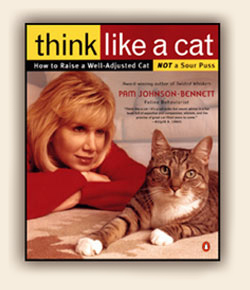 More than just a behavior book, Think Like a Cat is also an authoritative resource for cats’ people of all stripes. Topics range from where to get a cat to selecting a vet; from basic health care to treating more serious medical problems; from choosing a scratching post your cat can’t resist to secrets for avoiding litter box problems. Whether you are new to or well experienced in sharing life with cats, this thoroughly insightful book is bound to benefit you!